Beware of any book that is a self-proclaimed classic. 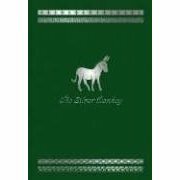 Candlewick Press’ The Silver Donkey by Sonya Hartnett is one such example. The definition of pretentious is “making usually unjustified or excessive claims (as of value or standing)” or “expressive of affected, unwarrented, or exaggerated importance, worth or stature.” Originally published in Australia in 2004, The Silver Donkey is the story of two sisters, one brother, one runaway soldier, and one miniature silver donkey. When Marcelle and Therese “Coco” find a ‘dead man’ in the forest they are eager to brag to their brother, Pascal, of their latest discovery--after all, it’s not something that any other child in the village could claim to have done. But wanting to doublecheck the facts before they tell anyone and everyone because it would be embarrassing to tell about a ‘dead’ man who was only asleep, the two go back to discover he is not dead...merely a blind man--a deserter from the army--on his way back home. Still the girls are proud to have discovered him. Their brother has never seen a blind man--let alone found a lost blind man in the forest. The three quickly become friends and their new ‘discovery’ turns out to be quite a storyteller. His stories are all fixated on donkeys. His obsession is seemingly founded on a small, miniature silver donkey he keeps in his pocket and holds for comfort. The book alternates between four stories the soldier tells his young listeners--the sisters and finally the brother--and between the ‘present’ day action of the kids trying to find a way to help this blind man find a way across the channel so he can go home. (The novel is set in World War I). The ‘lesson’ of the novel: war is ugly; war is horrific; there is no glory in war.